Regular webinars to discuss hot marketing topics and the impact they will have on Marketing Automation strategy. CleverTouch client Fujitsu share insight and best practices on to implement marketing automation technology across 27 countries. Understand the role of demand orchestration in marketing and how marketing technology can help marketers realise the promise of revenue marketing. The Simplification and Smarter Adoption of Marketing Technology Breakfast Networking Event. This session introduces the event agenda before diving into the key approaches that Marketers need to simplify the way they manage and use the technologies available to them. There are two areas of GDPR that are most relevant to us in Marketing - consent and legitimate interest. Without gaining one of these, we are unable to communicate with our marketing database in a post-GDPR world and therefore run the risk of losing a large percentage of our marketable database. Not only are we fearing that but with non-GDPR compliant fines being up to 4% of global turnover, this is a topic now very much on the radar of the c-suite. So how can we go about generating marketing opt-ins and capture consent? The General Data Protection Regulation (GDPR) is fast approaching and whilst there's lots of information about GDPR from an IT security perspective, marketers are still trying to understand the implications it will have on their marketing efforts from 25 May 2018 and beyond. As the modern email marketing landscape changes dramatically with the introduction of GDPR, this webinar explores the role of Marketing Automation in helping organisations stay GDPR compliant. Account Based Marketing is one of the biggest marketing buzzwords at the moment. 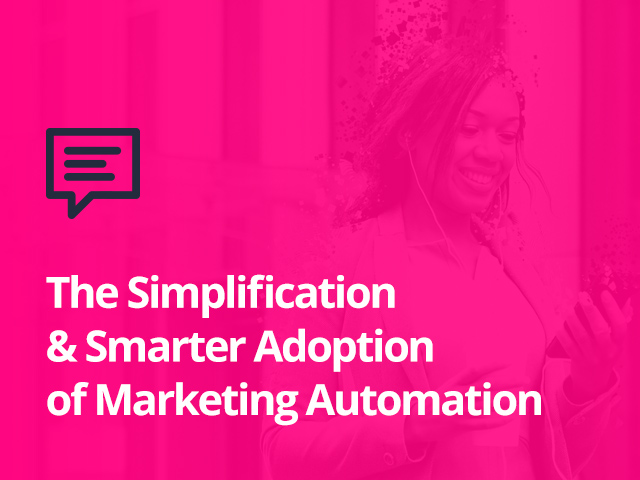 This webinar aims to dispel some of the hype around ABM and provide a reality check on what it really means for B2B marketers in the context of Marketing Automation.